Wet Floor is a five-piece band appearing in Splatoon 2. The male vocalist and guitarist. The female vocalist and guitarist. His Japanese name is KAGI and he is an Inkling. According to the HaikaraWalker art book, he founded the band using social networking services, and does not like performing live, rather spending time in the studio. MIZOLE is the male Inkling on guitar and vocals, and he is a fan of vintage rock sounds, as well as jazz and soul music. He considers himself a rival to the Squid Squad, particularly ICHIYA, and is responsible for the band's composition. Usually, he tries to create music that exceeds others' expectations. RYAN is the female Inkling on guitar and vocals, and is a fan of punk rock music, including Squid Squad. Despite their differences, she works alongside MIZOLE on composition, and compliments him by holding the same role in the band. KAZAMI is the band's drummer, and she is a candy crab. She does technical work for the band, listening to the recordings made by MIZOLE and RYAN and spending time to fix them. She enjoys watching MIZOLE and RYAN happily make music with each other, despite their arguments. TSUMABUSHI is the band's bassist, and he is a cutthroat eel. He is a self-paced, "big brother" personality for the rest of the band, and builds a thrilling rhythm team with KAZAMI. He has a trademark string-slapping style, and since most of their songs are only recorded once, he usually plays his part from only a quick look at the score. He plays at his strongest in the morning. 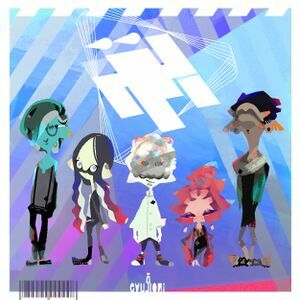 On 12 July 2017, an EP containing three songs and a version of Inkoming! performed by Wet Floor Shibuya released in Japan. It is part of a collaboration with Tower Records. On July 30th, 2017, Wet Floor Shibuya performed at the Shibuya location of Tower Records. Tickets were given to those who purchased the album there at release. Their name and album art was revealed in the 14 January 2017 Nintendo Switch livestream. There is a piece of gear themed after the band, being the Wet Floor Band Tee. An incomplete version of the album art was shown by the Squid Research Lab Tumblr account, while the @SplatoonJP Twitter account had art that looked finalized. This page was last edited on 6 April 2019, at 00:39. This page has been accessed 50,228 times.